Unsolved mystery: What are those weird bumps on the heads of humpback whales? It may seem strange to you, but baleen whales are actually covered in hair. Not a thick layer of fur like your family cat, but a smattering of around 100 fragile hairs dotted along their jawline. In most species, you can barely see these hairs with the naked eye. But on the humpback whale, you can’t miss 'em. Image: Mike Baird, Flickr. Image source here. Those distinctive bumps covering the heads of humpback whales are actually oversized hair follicles. About the size of your fist, these 'tubercles' form a kind of ringed fortress, protecting the hair inside. Within each tubercle is a bundle of thick nerve cells connected to the hair, which sticks out a few centimeters from the middle of the mound like a lonely flag. 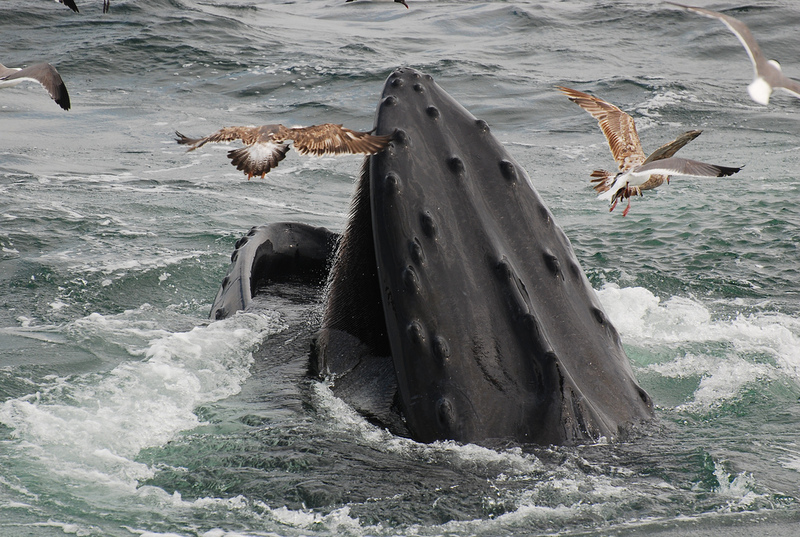 So what do humpbacks and other whales use their highly enervated and sensitive facial whiskers for? It's one of the best-kept secrets in the scientific world. And the secret is this: scientists don't really have a clue. "People have the impression that the science was worked out long ago," says Eduardo Mercado III, a psychologist at the University at Buffalo, SUNY. But that's simply not the case. Mercado studies humpback whale sensory systems, and recently published an article in Aquatic Mammals journal on the science of whale hair. In his review of the scientific literature, Mercado shows that whale hairs are clearly designed to pick up subtle vibrations in the water. "But what in the system is vibrating and what might cause it to vibrate are not clear," he argues. The hypothesis that most people accept is that whales use the hairs to detect the density of prey species they swim through when feeding, sort of like 'whale whiskers' that provide the whale with a crude estimate of the number of fish swimming past its face. But this widely accepted hypothesis is, according to Mercado, "a non-starter, despite its wide intuitive appeal". Nobody has provided a plausible explanation of how the hairs do this, nor why they’d need to be so sensitive. Radically differing hypotheses as to the function of whale whiskers are peppered throughout the scientific literature. Some scientists speculate that whale hair is capable of detecting low-frequency sound. Others guess it detects electromagnetic fields, like the hairs that have recently been found on dolphin faces. Still others think it picks up subtle changes in water movement, allowing humpbacks and other whales to execute dizzying underwater acrobatic displays in pursuit of their prey. It was even once assumed that the hair served no purposes at all, and was just a leftover evolutionary trait from when the land-based ancestors of whales needed hair to protect themselves from the cold. The reality is that whale hair – and humpback tubercles in particular – has received very little attention by scientists. This is partly because of the difficulty in obtaining samples of whale facial hair – a knock-on effect of the welcome global moratorium on whaling (but one that's also unfortunate for whale-hair anatomists). Mercado's study, one of just a handful from recent years, has helped shed some light on the function of whale hair. Despite rather substantial differences in the number and placement of humpback tubercles (ranging between 30 and 60 depending on the individual), Mercado found that tubercles form patterns around the head of the whale. 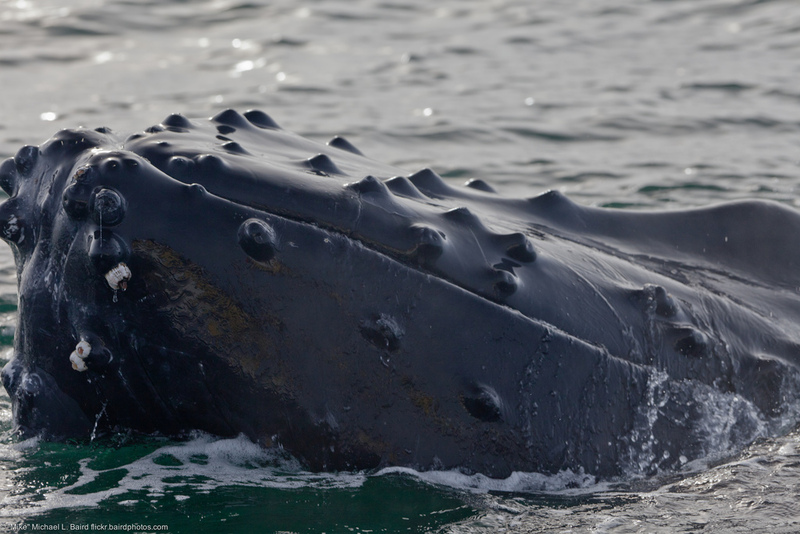 They cluster into distinct groups, resulting in symmetrical rows across the whale's head and jaw. Their non-haphazard placement – creating a kind of sensory array – would allow the whale's head to detect and localise movement or vibration in the water column. But Mercado is quick to point out that scientists still have no idea what kind of movement or vibrations this intricate array of head-hair is supposed to be detecting. Aside from the unsolved riddle of whale whiskers, there is the added question of why humpback whales evolved giant tubercles surrounding their hair. No other species has tubercles, and there is no explanation whatsoever as to what they are all about. "My assumption is that the large bump somehow enhances the sensitivity or resolution of sensation in humpbacks relative to other large whales," suggests Mercado. But the true function of tubercles, just like the sensitive whale-hairs they protect, remains a total mystery. Drone photography addict Justin Edwards captured this beautiful footage of a humpback mother and calf duo off the coast of Hawaii.